Boxing has a habit of seeing beaten fighters coming out of defeats with more credit than they went in. And for David Allen and Josh Wale, their respective stocks rose despite an unsuccessful night for South Yorkshire interest in Leeds on Saturday. 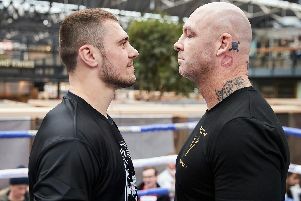 Doncaster’s Allen lost his unbeaten record on the wrong end of a one-sided affair in his highly-anticipated heavyweight clash with the rated Dillian Whyte. And the points margin was similarly convincing for Commonwealth super bantamweight king Gamal Yafai in his successful defence against Barnsley’s Wale. Wale’s performance against Yafai was hardly surprising. That he continues to be presented with title opportunities is down to his reputation as one of the toughest men in British boxing – and one who delivers consistently tough tests for the best in the country. And Allen proved he is cut from the same cloth as he took plenty of clean shots from one of the heavyweight division’s hardest hitters. For now, it is Whyte and Yafai heading towards bigger and better things. But the performances of Wale and Allen suggest they will be back at this level sooner rather than later. Allen’s social media campaign for a big name opponent delivered Saturday’s fight with Whyte and made it the most intriguing bout on the bill. In terms of intrigue and competition however, the bout failed to deliver. Whyte was clearly the more accomplished fighter throughout, regularly finding his way through Allen’s guard and working well off the jab. The Brixton fighter was the busier but Allen was happy to take whatever punishment was dished out. The problem was, not enough went back in the opposite direction and led to scores of 110-90, 110-91 and 99-91. “Two things let me down: inexperience and being up against a very good fighter,” Allen said afterwards. With added experience and considered work in the gym, Allen will surely return to the big stage again. When it comes to work in the gym, Wale showed the improvement he has been making since last year as he was never out of reach against hot prospect Yafai. “I tried something different, boxing rather than coming forward,” Wale said. Wale ensured it was a gruelling night for Yafai and delivered an entertaining fight against an opponent who had never been taken 12 rounds previously. Yafai was awarded the fight on 118-111 and 117-112 twice.